Forget McDonald's and Burger King. These Expensive Burgers Cost No Less Than $100 Each. Juicy and delicious beef goodness is all we want from the good ol’ hamburger. You might be a Shake Shack, In-N-Out, or McDonald’s fan, but are you willing to shell out a couple more dollars (even hundreds or thousands more) for a serving of burger? If you’re a die-hard fan of the hamburger, you might want to take a bite of these most expensive hamburgers in the world. Known for their Angus steaks, this pub located in Pensacola, Florida has more than 20 burgers offered in their menu, which includes the $100 “Grand Burger”. The burger patty is made of fillet mignon and is served with caviar and a glass of one of the world’s finest champagne. This $125 sandwich has a patty made from the three most expensive beef, which are Japanese Wagyu, Argentinean beef and American Prime Beef. This dish was exclusively served in Old Homestead’s Boca Raton branch, until the restaurant was shut down in 2006. Some New Yorkers are paying $140 for a burger at DB Bistro Moderne. Obviously, what makes the price of this burger high is the truffles sandwiched in the burger, as well as the two other layers of truffles on top; and besides that, this burger has a ground sirloin patty stuffed with braised short ribs and foie gras. Right at one of the most famous locations in New York, the Wall Street Burger Shoppe offered a burger priced at $175 made with 10 oz. Kobe beef patty topped with Gruyere cheese, black truffles, foie gras, and garnished with edible gold flakes. However, this burger isn’t available anymore after the resto filed for bankruptcy in 2011. The 6th most expensive burger in the world is again found in New York, Serendipity 3’s Le Burger Extravagant. With the price of this sandwich, you’ll expect that everything that this burger is made of is extravagant. The patty is made with a concoction of Wagyu beef, cave-aged cheddar, white truffle butter, black truffles, quail egg, and you’ve guessed it, caviar. As if the burger isn’t extravagant enough, the sandwich is held together with a toothpick that has a diamond tip. New Yorkers just love expensive burgers as another most priced burger from New York is included on this list. The Douche Burger that was offered by the 666 Burger food truck was sold at $666. What makes the burger so expensive? As the food truck owner describes it, the burger is “filled and topped with rich people s**t”, all from the pricey Kobe beef patty that is wrapped in an edible gold leaf, caviar, truffles, imported cheese, and foie gras. However, even if you’re willing to pay for this burger, the 666 Burger food truck unfortunately closed down a couple of years ago, making the Douche Burger only a part of history. 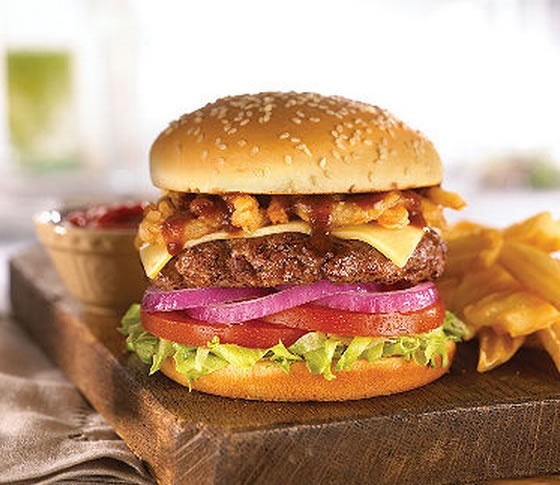 If you want to grab a bite of this burger, then you will have to travel all the way to Las Vegas, Nevada. Sandwiched in a freshly baked ciabatta, the 4th most expensive burger in the world has Kobe beef as its patty, and a Maine lobster on top. It also has proscuitto, Brie, caramelized onions, and a drizzle of a hundred year old balsamic vinegar. And oh, it also comes with a bottle of Dom Perignon Rose Champagne to pair with the $777 burger. $777 for a burger might seem too much for you, but with the Glamburger, you have to add $1,000 on top of that. 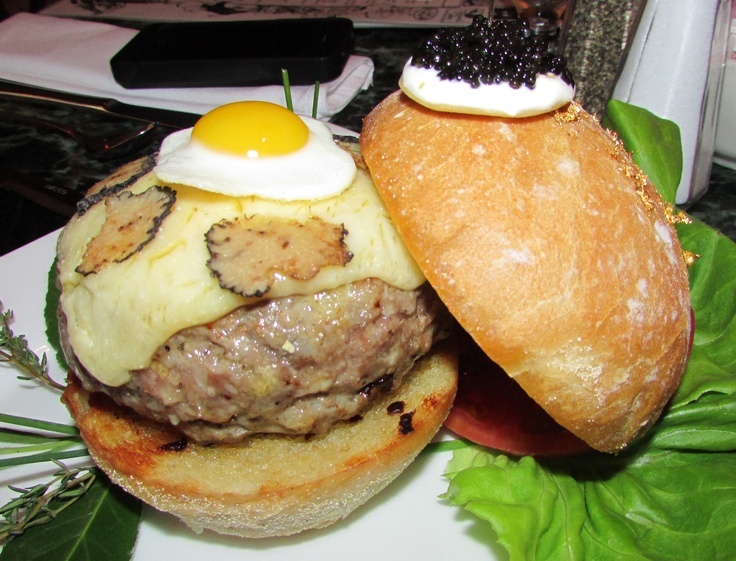 This burger patty is made of a combo of Wagyu and Kobe beef, topped with venison, lobster, caviar, black truffle, and a duck egg. 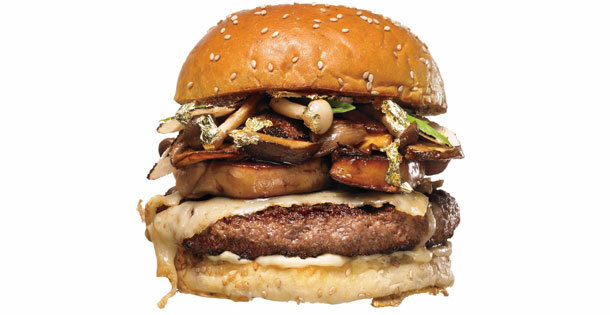 The burger is also generously “garnished” with edible gold leaf to prove that this burger indeed has “glam”. Another highly expensive burger is found in Las Vegas at Fleur Restaurant. Although the burger made with Wagyu patty and topped with truffle and foie gras is technically priced at $70, the $5,000 price tag is actually because of the pricey wine served with the burger. The most expensive burger in the world surprisingly doesn’t come from a kitchen, but a lab from a University in the Netherlands. Scientists from the Maastricht University are trying to culture a beef burger patty in a petri dish — although the burger patty is in its development stages and is still not edible.